Country Workshops is in the process of closing down. Our summer tutorials are fully enrolled. At the CW Store, all tools are now sold out. We still have a full selection of books and DVDs. We are keeping our web site intact, as an archive and resource. The Country Workshops Store was originally conceived as a supply source of hard-to-find tools for our workshop participants. Most of our tools are made in very small quantities by individual toolmakers in Sweden and the US. Handles for our Hans Karlsson hollowing adzes and the Viking axe are made and custom fitted in our own shop. A Note On Pricing. Some of our tools cost more than similar appearing tools sold by other vendors. We offer only high quality tools, which are usually expertly sharpened and ready for use when sold. 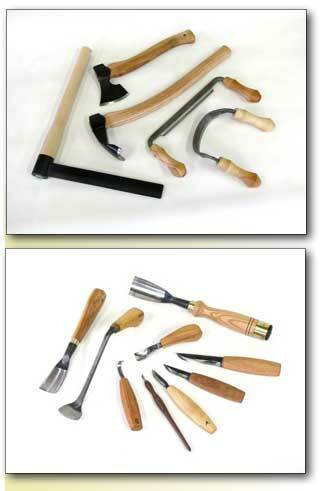 The selection and designs are the result of many years experience using traditional hand tools. Please phone us (at 828/656-2280) if you have any questions about our tools. Tools can be purchased three ways: Order by phone (Office hours: 9 a.m. - 6 p.m. Eastern Time) using your Visa/MasterCard for payment; order by mail, by clicking on Order Form (you can print the Order Form on your computer's printer, but we do not yet offer on-line ordering); direct purchase at our store and showroom. Orders from outside the U.S.
• Be sure to specify surface or air mail. Optional Parcel Post insurance is not available for all countries. There is a special low rate for shipping books by surface mail. • The easiest payment method is made with Visa or MasterCard. Simply sign the order form and include your card number and expiration date. We will bill for price of goods, actual shipping cost, plus a $5 handling fee. Some items may not be available for immediate delivery. Our tools are purchased in small quantities, and there is often a delay in the manufacturing process, shipping, or fitting handles. When your order is received, we will notify you regarding any delay and expected delivery dates. We believe that you will appreciate the quality of our tools, and hope that you will agree with our policy. Your patience is appreciated. PRICES. Our intent is to hold prices until publication of our next catalog. However, fluctuations in exchange rates and other variables may force us to adjust prices on some items. If there is a difference, we will notify you before shipping. We accept personal checks, Visa/Mastercard, money orders and cashier's checks. We do not take C.O.D. orders. OUR GUARANTEE. Please contact us if a tool or other item does not meet with your approval. Usually we can help resolve the problem over the phone. If you are still not satisfied, we will authorize a return providing that the merchandise is in original condition. GIFT CERTIFICATES. Fine hand tools and workshop tuition can make very special gifts. However, the most appropriate selection is often best left to the fortunate recipient. We can issue gift certificates in any amount. Gift certificates can be exchanged for tuition or store merchandise. I wish I would have found your tools before I wasted my money on those other so called high quality tools (two cherries). I cannot believe the quality of your tools. By far the best I have ever seen. I first got the HK-09 and HK-25 to try them out. As soon as I took them out of the box I could see the quality and craftsmanship that went into these tools. Wow ! Was all I could say. I have done four projects with my gouge and have yet to sharpen it. It is still as sharp as the day I got it. I love to hold it in my hand. Not only is it a tool but a work of art. I know for sure that your tools will be passed on and used for years to come when I am gone. Thank you for selling such great tools at such a good price. My goal is to own every tool you sell. Thank you again. Quality is something you don't see much of these days.